I suppose it had to come to an end some time. Since very early in the year when I started my whole ultra running adventure, I’ve been really fortunate in that I’ve been able to maintain some semblance of balance between home life, work and my new found love of running. Somehow or other I’ve managed to keep all three parties in the equation happy. Over the past 4 weeks though, the scales have been well and truly tipped in the favour of work, much to the disappointment of my home life and my running addiction. In some ways, I’m happy to have had a break. The Ben Nevis race broke me and really felt like a race too far for me this year, so I’ve been happy to kick back a bit and take things easy. On the other hand though, slowing down in running stakes whilst travelling for work has resulted in a few pounds gained and I am immediately noticing the difference! My work frequently gets me travelling around and the past few weeks have been a rare, intense period for travel that typically happens at this time every year. In the past three weeks I’ve been to Singapore, Lisbon and Austin. Not bad do I hear you say? Well, it is exciting to visit those types of places for sure, but when the main purpose is very focused on work, it is pretty tiresome. I am very good at trying to make the most of work trips like this though. I aim to get out as frequently as I can for runs to explore these places and also try to find places off the beaten track to visit to eat and drink to get a sense of what the places are really like, away from the tourist guide locations. In all three, I think I did pretty well this time around. Singapore was my first destination and as well as being a new place for me, it was also as far east on the planet that I’ve ever been to. My first impressions were that it reminded me a lot of Dubai. IT had a very cosmopolitan mix of people from all over the world, a perpetually warm climate and colonial connections with Britain which made many things strangely familiar for a foreign country (plugs, Driving on the left etc.). I liked Singapore. I got to experience a load of new Asian foods, which are generally my favourite, so that probably swayed me to enjoy the place. 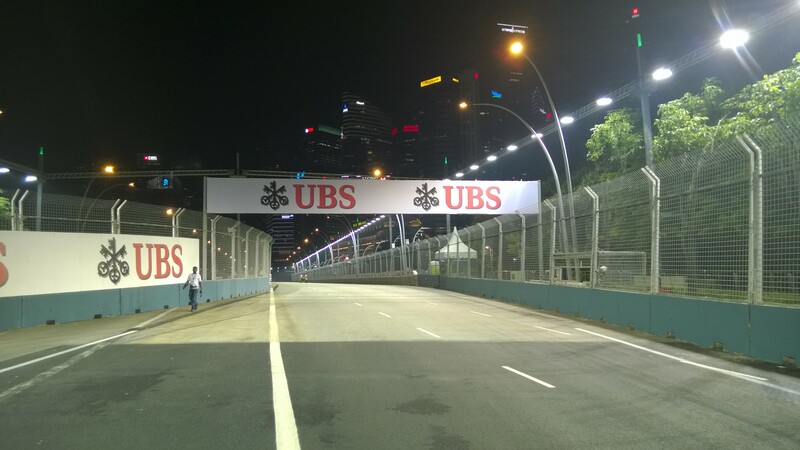 The Formula 1 GP was on the weekend after I left so it was interesting to see the city preparing as the streets were turned into a race track. I got to run a few times too, which was an experience given the 100% humidity. The overriding memory of Singapore though, was the haze and pollution. Sadly, neighbouring countries in the Islands around Singapore take to burning plantations at this time every year to make way for new crops to produce Palm Oil. I’d heard about this stuff and the damage it is doing to nature in its production, but until I’d seen how much of an impact it can have on the environment, I didn’t pay any attention. In short, it is devastating. 1000’s of acres of land are burnt each year with no consideration given to the wild life on that land. Natural environments are destroyed and the air for hundreds of miles is polluted for weeks with harming particle pollutants. I’m looking very carefully at what I eat now to ensure I don’t support the Palm Oil trade. On a more positive note, the food in Singapore was great. I loved the street hawker locations where you can get a huge variety of foods all in one place. They were clean and cheap, and with the ambient temperature hovering around 30 degrees, it made for some wonderful evenings eating outside. I also took the opportunity to do the tourist thing and visit Raffles for a Singapore Sling. Two things stood out for me there, wow is it a sweet drink! Also, wow is it expensive! That will teach me for trying to be a tourist! Next up was Lisbon. I’ve been to Lisbon once before and enjoyed the place. It has a very laid back atmosphere and the weather at this time of year is perfect. I was there for work, so excitement levels were low, however, the hotel we stayed and used for most of our meetings was damn impressive. 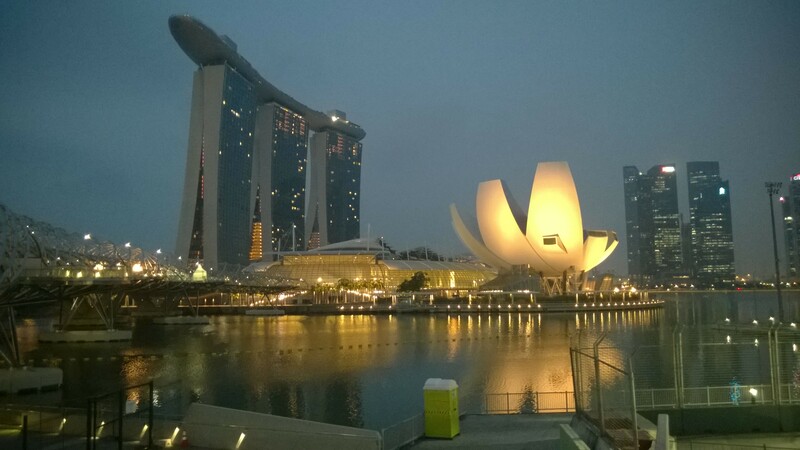 I managed to get out for a few early morning runs around the waterfront by the hotel, but my jetlagged body after Singapore was finding it difficult to get up early before work. 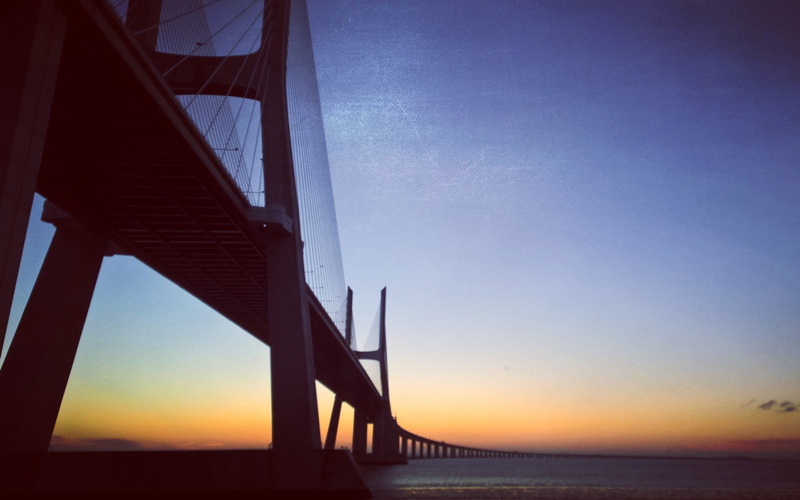 When I did though, I was treated to some spectacular sunrises against the outline of the nearby Vasco da Gama bridge. 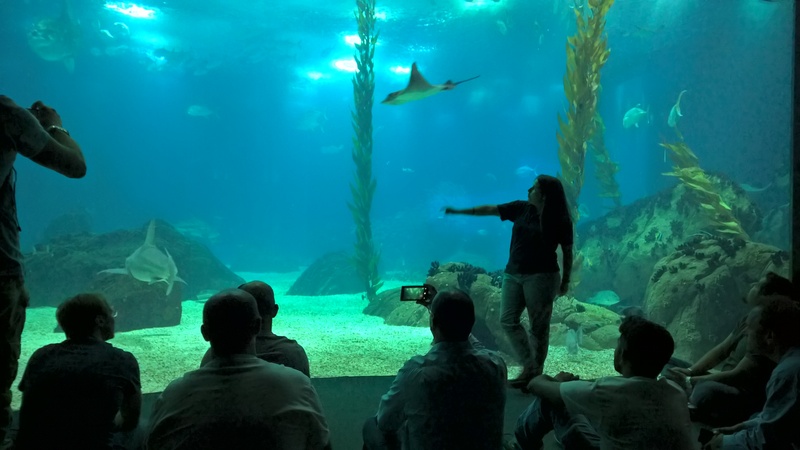 My team had arranged a night at the Oceanarium in Lisbon for us, which was pretty special and a nice way to end a day at work. After a couple of long days of meetings, jetlagged sleep and early morning runs, it was easy to sit and watch the sealife gently gliding around the enormous tanks in the low level lighting. I think I could have stayed there for a day or so and had a very deep sleep. After Lisbon, a weekend at home to catch up on some sleep and say hello before jetting off again, this time to Austin, Texas. I’ve been to America many times now in various different locations, but I’d never been to Texas before so this was a new experience. I wasn’t sure what to expect, I knew it would be hot and I’d been told that everything in Texas is just bigger than everywhere else. Whoever said that was correct, look at the size of the hire car I was assigned when I arrived! 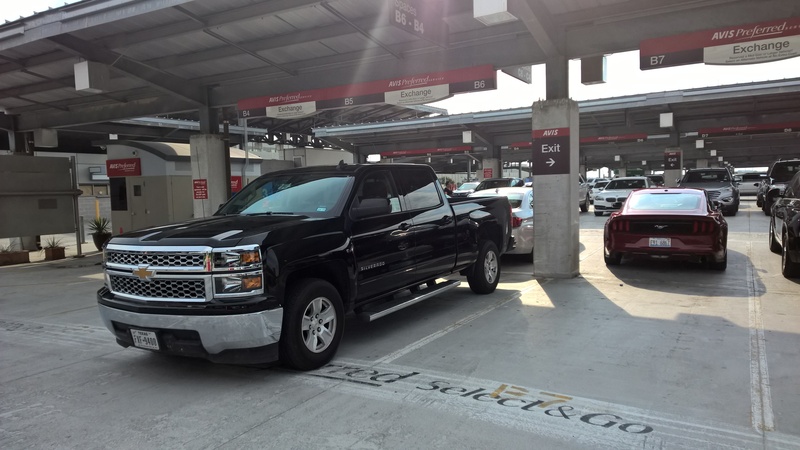 I politely asked them if they had something smaller, and was given a Jeep for the week. Oh well, when in Rome…. I’d heard that Austin in particular was famous for music, food trucks and barbecues. From the first day I got to experience all three and, as it turned out, I experienced all three every night I was there. I can confirm that there is only so much meat a person can eat in one week and I found that limit. I’d taken a look on Strava before arriving to try to find some longish runs for whilst I was there. I discovered that there are several green belt areas around the city which have single track trails which sounded fun. I knew I’d have jetlag and would be awake really early, so my plan for the first morning was to head out with my head torch to one of the areas called Barton Creek. This is a creek which flows in to the Colorado River which cuts through the city. At this time of year it was a very dry creek with barely any water to be seen. Along each side though ran compact trails which provided a great place to run. I managed to get in a 18km run on the first morning, I was hoping for longer, but it took me so long to find the actual trail, by the time I did the sun was up and it was almost time for work. 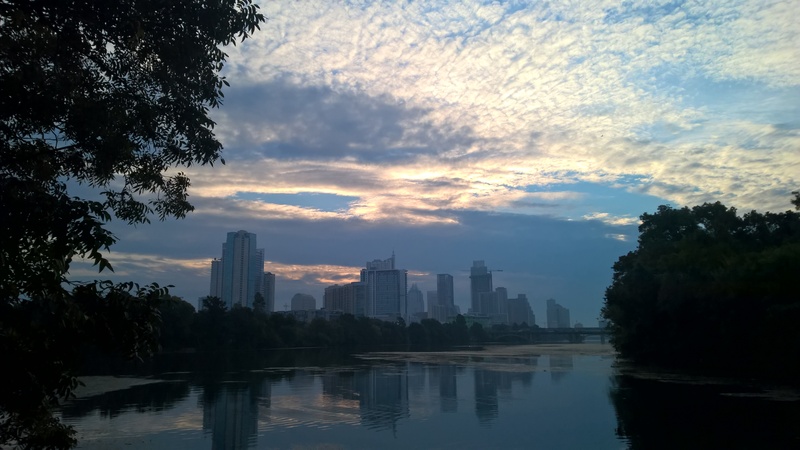 I also managed a couple of other runs in the same area around what is called Town Lake; effectively a stretch of the river. It was nice running in such warm conditions. I adopted the locals approach of running in just a pair of shorts, no t-shirt, and it felt strangely liberating for this pale skinned individual from Scotland! The whole BBQ food thing was interesting to experience, but ultimately lost on me as someone who isn’t a huge meat lover. Having it three nights in a row probably took the shine of things too, but I am glad I got the opportunity to try. One of the nights the team arranged a tour, which included a visit to a barbecue place for dinner, but also took in a live music pub and some food trucks. The pub was the Saxon Pub, which is seemingly famous for having hosted many famous singers and groups for live performances. It was great music I have to say. The tour then took us to a food truck somewhere else in the town, where we got desert in the form of a frozen banana dipped in Oreo Cookies. It was a lot nicer than it sounds. All told, it has been a tiring three weeks of work travel. Too many late nights, too much rich food and too little running. I’m glad I got out when I could, but wish I’d ran more. Now it’s time for some weeks at home and to get back into a healthy routine. I’d like to run 5 times a week at least, try to get around 80km’s a week in for a couple of weeks in time for the Jedburgh 3 Peaks Ultra later in October. I went out for a run in the Ochils yesterday which really didn’t feel great at all, but it was good to get some hills back under my legs and be out there. More work required though if I’m going to be ready for the 3 Peaks ultra. My final bit of news is that I have switched allegiances from Garmin to Suunto. I was just totally fed up with my 910xt constantly struggling to sync over ANT+ via my laptop to the rest of the waiting world on the internet. I’ve switched to a Suunto Ambit3 sport and I’m already delighted with it. Tough luck Garmin and hello Suunto!